You know what? I absolutely love being a video game collector, more specifically, a collector of the Sega Genesis and its two add-ons. I consider myself a connoisseur of fine games but will still play hordes of bad games with friends for hours just for the laughs alone or in hopes of finding some diamond in the rough. Everyone knows that the Sega CD is a dead pool for obscure ideas and bad gaming concepts. It’s not that it doesn’t have any great games, because it does. it’s just that there’s such a plethora of lameness on it. Well, Racing Aces is the game on trial this time around. I honestly played it with my gaming buddies several times just to rip to shreds, but I never was able to sit down with it and give it some hard and honest playtime. I finally started playing it again, and it started out pretty lame. I wrote it off as one of the worst the Sega CD has to offer, but then after I played through several races for this review’s sake something clicked. I don’t know what happened exactly, but something just started to make sense, and the game wasn’t nearly as bad as I thought it was. Quite honestly, it actually became a lot of fun, and I kept playing it for several days and actually won several races and made it through several circuits of the season despite the game being pretty difficult. Racing Aces takes place after the Cold War, where an organization has come together to race many of the old planes that have survived the war. There are thirty playable characters, are of whom are all parodies of famous people of the time. There is a total of nine planes to choose from, some of which have to be purchased with prize money from races. For being such a bizarre racing game, it is probably the most in-depth racer on the Sega CD. I guess I have to start out by saying that I’m surprised and amazed that the programmers got this game to work at all on the console without the help of a SVP chip or the 32X’s enhanced capabilities, because it’s a fully 3D game with no FMV present. There are roughly forty fully-3D tracks in the game. They are extremely choppy and move at a very low frame rate, but they are amazing nonetheless. Either way, this game actually makes great usage of the Sega CD’s disc space and the system’s capabilities. 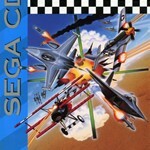 I guess I also have to congratulate Racing Aces on its awesome soundtrack. It makes perfect usage of the CD capabilities, and there are many tracks, and all are worth listening to. You start a race against eight opponents, and after a few seconds your guns activate, and you can fly into power ups and gain different guns, two different speed boosters, missile flairs, shields and a few other goodies. There is a shop where you can buy power ups and boosters and new planes. Every once in a while, a screen will pop up with a black market seller who will offer you exclusive power ups and upgrades, and if you don’t choose fast enough he will sell it to someone else. If you start veering off course too much there are deadly skull icons that will make you explode. Each course is a five-lap race, and whoever you shoot down will become your mortal enemy that will have it out for you for several races to come. I guess I have to point out the gaping flaws, which are plenty. To start, this game is just too much with too little to work with. The Sega CD is woefully underpowered for a game of this caliber. It would have been much better suited on the 3DO or Jaguar or even the 32X with its added power. The backgrounds are pretty much reduced to single color blocky polygonal objects that have to represent the backgrounds. While it works to a certain degree, it fails simply due to the fact that the Sega CD or Genesis just can’t put out the high resolution and smooth frame rate required to make a game like this run right. Control is also an issue. Racing Aces should’ve been held off until it could have been released on a console with an analog controller since the steering and handling is so sensitive, especially since controlling a plane is a lot floatier than steering a car. In this game’s defense, this problem plagued many of Sega’s 16-bit racers. The game also does a fairly poor job of keeping track of your placing. Many times, I was in first place, and then it said I fell to fourth or fifth place when no one passed me, only to cross the finish line and find out I still got first place. What’s up with that? Despite the many gaping flaws, I still found Racing Aces to be a pretty fun game, but I had to go the distance and spend the time with it needed to get over the learning curve. It’s a pretty hard game. Most races have shortcuts, and you need to find them and use them, or you won’t stand a chance. Honestly, this game felt like Micro Machines with airplanes and weapons since it has a semi-comical fee to it. Still, Racing Aces hasn’t aged too well at all, and so most will be hard pressed to sit through it, but if you do then you should have some fun with it. I really had some fun but will admit it would’ve felt more native and would’ve played much better had it been on a console with the power to run it properly. playing this reminds me of an early playstation one game, only it’s overall gameplay resembles that of a demo. im sure that back in 93 this game was enjoyable, but it’s hard to get into it with the slower than normal gameplay. it’s not impossible to play but does take some practice. although still worthy of a cheap purchase, id give it a 5/10.